The cleanliness of laundry is never more than a cover for the inherent bloodiness and destruction of love. Shocked and relieved in equal measure, as on the first day my daughter had asked for the princess dress and wanted to play Cinderella, only to suggest she be the evil stepmother and I be Cinderella. That day she’d said, “Cinderella! This house is a disaster! Sweep the floor!” Now. I picked up the tiny, white egg, whose shell in the lamplight was so warm and fragile I was certain I could see the bright gold yolk through it. I tenderly placed the egg on a shelf of air, and, unsurprisingly, it fell into the shrubbery one storey below. I may well be the only woman from the State of Texas to have turned 40 without ever having owned a washing machine. I have recently acquired one in Tel Aviv, a city devoid of laundromats. Mine is a German front-loading model, an AEG Lavamat W820. It is about fifteen years old and quite small—I can do one pair of jeans, one poofy princess dress, a large bath towel, a couple of shirts and a couple of pairs of undergarments per load. In final spin cycle, it shakes so hard that anything you’ve placed on top will be flung across the bathroom, and the machine itself will have scooted several centimeters across the floor. But it is mine. No more hand-washing in bathtubs or cooking pots. No more carting enormous bags of laundry to friends and family. And now that I no longer live in the United States, no more waking up at ridiculous hours to use the apartment building laundry room. Though I did appreciate the laundry room book and used goods swap at 1712 16th Street in Washington, D.C. I still own a crystal decanter and a guide to Ireland from that room. With the White House three-quarters of a mile away, Congress one metro strop away, the Smithsonian museums on the mall, the Shakespeare Theater half a mile, many of the other inhabitants of the rent-controlled building had fine taste and impetuous temperaments. In the Middle East, we do not use driers. Everyone in the building has laundry lines of equal length lined up, floor by floor, outside the bathroom window, all the way to the top of the building. Since our apartment is on the first floor, we are vulnerable to the laundry and the mopping schedules of our neighbors above us. If someone dyes their clothing, or paints their walls and tosses the paint out the window, as the child actress above us once did, our clothing receives the dye. We learned not to hang laundry on Friday mornings when the neighbors cleaned their floors. Israeli mopping consists of tossing a bucket of sudsy water on the cement or tile floor and pushing it through the apartment with a rubber mop, then squeezing it through a hole in the corner where it drains outside. 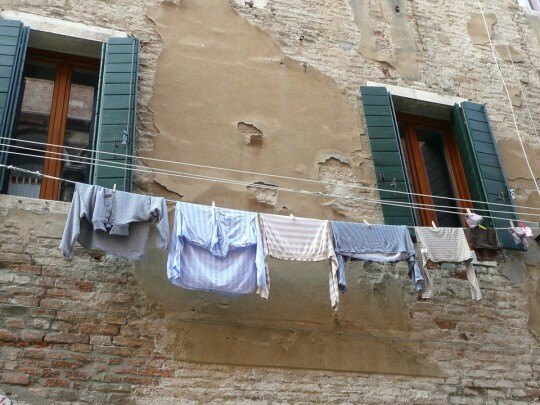 The hole is, of course, centered over the laundry lines, and our freshly washed clothing would often be rinsed in dirty, soapy cleaning water. We’d have to wash all over again. If we do not remove the laundry before sunset, it becomes spackled with whatever fruit is in season—ficus fruit, mainly, processed by and squirted from the backsides of the cooing doves with names like rock pigeon, stock dove, laughing dove, namanqua dove, ornate collared. And of course, there are the bats—teethy fruit bats, awkward angels. When I am not doing laundry myself, I am translating folkstories and poems about laundry, mostly from nineteenth century Bohemia and Moravia, and mostly by K. J. Erben. During one of my research trips, I fell in love with a 90-year-old woman in a remote village in Southwestern Moravia for the combination of long underwear and ruched skirts on her laundry line. It’s true that she was cruel to the dog she had tied under the oak tree next to the door; her house had no running water; she had a wood-burning stove. The twentieth century might never have come and gone, which, in that part of the world, may have been a blessing. She had planted rows of onions, potatoes, and spinach up and down her hillsides. Once I came to see her with her daughter and granddaughter, who was my age. She informed us all that when she died she wanted to have them pour cement over her grave, because surely no one would take the trouble to visit her grave and keep it up when she died, and she didn’t want to be humiliated. She also called me a sissy for refusing a third shot of schnapps at 10am. She was a self-reliant woman who had once been very beautiful. To have survived her beautiful youth without a washing machine must have taken this kind of inner strength, if Czech fairy tales are any indication of the various of dangers that lurk for beautiful girls near outdoor washing sites. For I had just begun translating a collection of Czech folk stories around the time I’d met this woman. made a bundle of her clothes. “Oh no, sweet child, not to the water! Stay home today, my little daughter! A strange dream came to me last night. nothing she longs for. Still, she goes. the bridge beneath her begins to break. and water closes over the girl. a ring is spreading wide and thin. The image of that single, wide, thin ring spreading is appalling…I see it slow and silent—the newsreel blank, for it’s too awful to write what just happened and too late to do anything about it. And so very easy to have prevented. Now a baby is going to have to die horribly by the end of the tale. This would not have happened if the girl had had a washing machine. The brothers Grimm have a version of this story in which the water sprite is a woman; she convinces a formerly wealthy merchant to give up the next creature born into his household in exchange for renewed wealth. He assumes he has traded a puppy or kitten for glamorous riches. Apparently, he’s simply not noticed that his wife is 9 months pregnant. And before he’s returned home, she’s borne him a handsome son. Everyone forgets the promise until the son is old enough to hunt. He then falls into the water (and thus, into the hands of the water sprite) while he’s washing his hands and knife after killing a stag. Luckily the son has a true love. She must give up a golden comb, a scuttle and also a spinning wheel to get him back. But when the comb, scuttle and spinning wheel hit the surface of the lake, the meadow floods, as if the entire lake were a front-load washing machine whose door, when prized open, floods the bathroom. And the two loving parties are washed away to disparate parts of the world. It takes them the rest of their lives to find one another again. This seems about right, judging from my own experience with laundry, love and fairy tales. I never liked using public laundromats. I have a resistance to indoor, public places in which electric-powered machines turn round and round. I avoid gyms for the same reason. I suspect I would have loved banging my basket of wet clothing over rocks with the rest of the crones in pretty rivers. I spent more time at the ancient stone washing-house in my French aunt’s village than I did in the vineyards and cathedrals combined. I love the fact that Sapo Hill in Rome is named for soap. That the soap was made from the fat of sacrificed animals. Cleanliness is close to godliness, said the American inventor of the washing machine, James King (whose name sounds suspiciously like King James). The first washing drum was built in 1857. It was still hand powered. The first washing machine was, apparently, a birthday present from one midwestern husband in Indiana, William Blackstone, to his wife in 1874. I wonder if the novelty of it made up for the fact that he was, in fact, giving her a household appliance. I wonder how old she was, how long they’d been married, and what he’d been doing to make him want to keep her away from her girlfriends at the communal laundry rock. This machine cleaned the clothes, but it did not remove the water from the garments. You’d still need to beat or wring them. In Littlefield dormitory (built in the 1920s) at the University of Texas, where I lived as an undergraduate, each floor boasted a large, spacious laundry room which contained a couple of long, narrow sinks with presses attached to squeeze the excess water from laundry. They were also equipped with a crimped metal roll to crimp your collars and sleeves (didn’t work on hair). but I don’t know what he sees. I washed my clothes last afternoon, they are clean (translation mine). Between the first and last stanza, the speaker has enjoined a boy to run home and get a rifle to kill the chicken hawk that’s getting at the hens. If the speaker is a man, the laundry cleanses the clothes of rival blood. But do men do laundry? I’m not sure if it’s permitted in fairy tales or folk songs—he probably means he had his clothing washed. And if that’s the case, the man’s wife must have a washing machine, because I don’t think the things would be dry by now otherwise. A former roommate and I would regularly use her salad spinner to press the water out of our dainties, otherwise they’d have taken at least a day to dry. And these dainties were rather filmy and lacey. Much heavier are the clothes of a jealous cattle worker on the Venezuelan planes. If the speaker is a woman, then perhaps the river exposes the idea that human character is never capacious enough for the violence of human passion. A washing machine compensates for that—with a machine, we no longer suffer the consequences of our impulses—we do not fall prey to water spirits, for example. And those of us who symbolically do fall prey, for example, unintentionally single mothers like myself, are able to find joy in our child, rather than the madness, poverty, and suffering of the fairy tale mothers who are cut from their communities. Especially in the child who commands us to sacrifice the bird’s nest rather than our own. Marcela Sulak’s poetry includes Decency (2015), Immigrant (2010), and the chapbook Of All The Things That Don’t Exist, I Love You Best (2007). She’s co-edited Family Resemblance: An Anthology and Exploration of 8 Hybrid Literary Genres (2015) and translated four poetry collections from Czech, French, and, most recently, Twenty Girls to Envy Me: Selected Poems of Orit Gidali (2016). She directs the Shaindy Rudoff Graduate Program in Creative Writing at Bar-Ilan University. She also hosts a weekly radio podcast on TLV.1 called Israel in Translation, and edits the Ilanot Review.